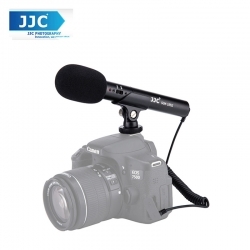 JJC SGM-185II DSLR/Video Mini Shotgun Microphone is designed to increase the acoustics effects when you record a video, so that you can get a better production value of video.The SGM-185II has a fashionable appearance and is made of metal. It is powered by one piece of 1.5V AA battery. The inbuilt LED lights will show you how it works. The inbuilt LED lights indicate battery levels Dim light shows low battery level. The newly designed shoe-mount clip with the adjustable knob allows user to adjust microphone operation angle and to capture voice at different directions.The flexible cable with max length of 90cm will enable you to hand-hold the microphone while you are recording and expand the range of application.This mini shotgun microphone can easily mount onto your camera, camcorder as well as other devices with a 3.5mm mic-level input jack and standard hot shoe.We all know that the function of the built-in microphone of a camera is limited and can't avoid bad effects, such as wind noise. However, with the help of SGM-185II, you may not need to worry about this. The package includes a foam windscreen that helps to decrease vocal plosives and wind noise and to keep the voice natural, clear and accurate when a sound is picked up from a long distance. JJC SGM-185 is an ideal tool for variety of recording project.